This week I am hosting the Gluten Free Menu Swap. Woo! The theme is Holiday Treat Week. 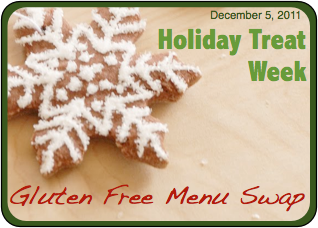 We still have time to whip up a few gluten and dairy free treats before the holidays, so let’s get baking! So far, I have baked (and have in my freezer) Candy Cane Cookies, Gingersnap Cookies, and Pumpkin Cookies. I have some mini Cardamon Almond Muffins and Lemon Pound Cake in the freezer also. 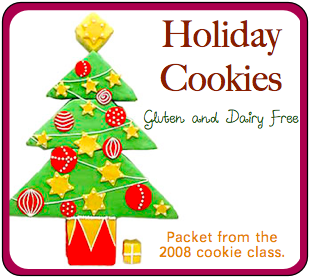 This weekend I will be having friends over to decorate Vanilla, Brown Sugar and Gingerbread Cutouts (from my Holiday 2008 class) and can’t wait! For at home as as gifts, I still need to make biscotti in different flavors, assemble some gifts in a jar, and bake a few mini loaves of sweet quick breads. This weekend the kids and I will assemble those also. I would still like to make some spritz cookies, brownie bites and chocolate filled peanut butter cookies. Yeah, I am all about the treats this time of year! The great thing is that I can easily assemble a cookie tray from treats in the freezer, or grab a few cookies on the way to a holiday party for my kiddos, then leave the rest for another occasion. Because I spread my baking out over a few weeks and freeze everything we get to have a big variety, which is my favorite thing about the cookie platters at Christmas. 🙂 What do you like to make for the holidays? Just in case you think I am completely off my rocker with the holiday baking I do, the treats I make are really part of my gift to my family. I always check and see what it is (they can pick one thing each) that they each would like for me to make. Also, I have several friends with allergies that don’t like to bake as I do, so I love to gift them with a little baking love. Over at Once a Month Mom this week we are profiling Gifts from the Kitchen (my Gifts in a Jar post will be up Wednesday). Do you like to make gifts from your kitchen? What do you give? This week it seems as if every activity that can do something extra has something going on this week. We have a band and orchestra concert (two different kids, different locations on the same day – yuck), drama meeting practice, a Girl Scout silver award workshop, the youth group has a movie night, etc. scheduled… Oh, and I just found out the orchestra is also playing one song in the choir concert this week (which means they have to be there for the entire concert, during a week the orchestra already had a concert on another night. I am not sure why that seems as if it is a great idea to everyone else, but it makes me tired just thinking about it.) Ugh! So, I am relying on my freezer stash, the crock pot and lots of chamomile tea this week! Debbi of Debbie Does Dinner Healthy is having a delicious week with Green chili chicken cordon Bleu, Ground Turkey and Quinoa Patties, Twice Baked Cauliflower, GF Lasagna, Chicken Wild Rice Soup and Pizza Steak Sandwiches. For a dessert she is having Sweet Potato Pie with GF Gingersnap Crust. Yum! 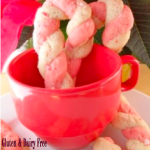 Heather at Celiac Family is really getting into the holiday spirit this week! She will be visiting Santa, decorating and baking tasty treats like Snowman and Christmas Tree Meringue Cookies (I have to make those! They are too cute!) and Sugar Cookies. On her menu are Parmesan Chicken Nuggets, Baked Ham and Quinoa with Broccoli and Mushrooms, Beef and Vegetable Soup, Pancakes, Wild Rice and Artichoke Salad with Grilled Chicken Strips and Fried Fish Bites with Debbi’s Broccoli Apple Slaw. Sounds wonderful! Emily at Our Frugal Happy Life will be having a different sort of week for her. With going out of town (by herself! Woo!) and advent dinners at church she gets 9 days off in a row from cooking. Wow! But she does have some good things planned: Stuffed Pepper Casserole and GF pizza. I love that she is still planning when she isn’t having to cook. 🙂 Have a great trip, Emily! Renee at Beyond Rice and Tofu will be making Buckeyes and Chocolate Fudge. On her plate this week is Spicy Black Bean Chili with Green Chili-Cheese Tamales, Roasted Tofu with Scalloped Potatoes and Brussels Sprouts, Tart-Hot Kidney Beans with Broccoli and Rice, Make-your-own Pizza night, and Chickpea Stew with Sweet Onions and Salad. 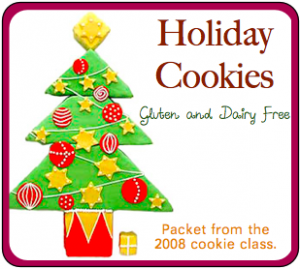 Wendy at Celiacs in the House is using up pantry and freezer items to clear the way for the holiday goodies coming. She is saving most of her treat making until her daughter comes home from college. Fun! On Wendy’s menu this week are Broiled Tilapia with Thai Coconut Curry, Slow Cooker Vegetable Soup, Chicken Fajitas, Pasta with meat sauce, Turkey burgers, Tofu Fried Rice with lots of veggies, and pizza night. Sounds great! This post will also be linked up to Menu Plan Monday at Organizing Junkie. Angela- My post is up: http://celiacsinthehouse.com/2011/12/a-gluten-free-weekly-menu-plan.html Thanks for hosting this week. I'm off to check out your gingersnap recipe. 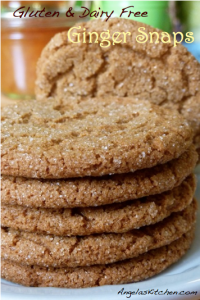 If I had to choose a cookie to make just for me, it would be a gingersnap. Love what you are doing with Once a Month Mom. Looks like a busy week for you, too. Looking forward to those gifts in a jar!